Peter: If we don't raise $20,000 in one week, we'll have to move. Bobby: And go to a new school! Jan: And make new friends. Marcia: But Jan, you don't have any friends. To make a parody of The Brady Bunch would seem redundant. After all, the popular 1970s television series, about a man named Brady with three boys who marries a woman named Carol with three daughters, almost parodied itself. Set in such a bizarre, otherworldly realm, it was a vision of family life where the kids rarely fought, mom and dad were the ideal couple, always able to solve arguments with a suggestion of a potato sack race, and the maid was willing to work 24 hours a day to feed eight people and a dog (in the early seasons, anyway). Everything was perfect in the Brady world, and if it wasn't, it would be by the end of the episode (unless it was a rare two-parter). What better way to reveal this incongruence with reality than to plop the family down in the real world? 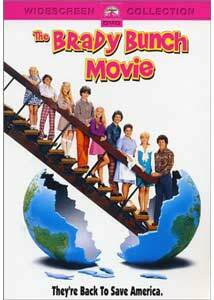 The Brady Bunch Movie does just that. They are still the same dopey family, but they're living smack dab in the middle of the 1990s. They are so used to their simple conflicts, they don't notice that the neighbors can't stand them ("They're freaks! That Astroturf they treat like real grass? "), and they're surprised when unable to find an instant solution when they're told they must come up with $20,000 in back taxes, or risk losing their home. The plot is fairly inconsequential, just a loose framework upon with to hang parodies of some of the series most memorable moments and plenty of opportunities for the outside world to be dumbfounded by the flawless family. Fans of the show will be able to appreciate more of the gags ("Tiger, Tiger... whatever happened to that dog? "), but everyone will enjoy the Brady's clueless interactions with normal folks. When they encounter things that don't mesh with the Brady way of life (Marcia has a lesbian admirer at school, and Greg's unsuccessful transformation into rock star "Johnny Bravo" gets him laughed out of the studio), the solution is simple. "Put on your Sunday best, kids. We're going to Sears!" The casting is note-perfect. The performances work because the actors are never in on the joke�they're slavishly faithful not only to the quirks of the original series' actors, but to the general bubbly, innocent tone of the show. Mike (Gary Cole) is always dispensing nonsensical parental wisdom with the utmost sincerity, and Carol (Shelley Long, a virtual double for Florence Henderson) is always cluelessly supportive. The kids seem to have been cast mostly for their physical resemblance to their forebears, but they nail their parts too, particularly Christine Taylor as Marcia, blissfully self-centered, and Jennifer Elise Cox as Jan (cast here as a borderline schizophrenic whose "Marcia, Marcia, Marcia" jealousy triggers a psychotic break). Her crazed looks as she listens to the voices in her head are the highlight of the film, and I've never been able to watch Eve Plumb on the original show without thinking of her cackling manically as she imagines Marcia getting hit repeatedly in the face with a football. Director Betty Thomas recreates the pastel visuals and cheery tone of the series, and contrasts them nicely with the gritty 1990s, but the script leaves a bit to be desired at times. Some of the gags are funny; some feel like they are only there because they were there in the series. Michael McKean is oddly flat as the villain trying to take the house, but he isn't given much to do, either�the crisis is necessary only so the Brady kids can finish off the film with a big musical number. Not that it matters. If the most difficult problems can be solved in 30 minutes, why bother filling up 90 with a superfluous plot? Image Transfer Review: The Brady Bunch Movie is the kind of film DVD was made for�bright, eye-popping colors and lots of detailed production design. While I'm happy with the transfer presented here (it certainly blows my VHS tape out of the water), it isn't quite as vibrant as I'd hope. Colors are generally very bright and saturated, but some scenes look a bit muted and rather soft. Otherwise, detail is good and blacks are strong. The print shows a few minor marks once in a while, and there is some visible grain, though nothing too distracting. I didn't notice any edge enhancement or artifacting. Overall, a nice transfer, if a little fuzzy. Audio Transfer Review: The DD 5.1 soundtrack suffers from the same front-heavy mix that plagues many comedies. That's not such a bad thing, since the front soundstage sounds pretty strong. Dialogue is always clear through the center channel, and the front mains handle the score and goofy sound effects with good stereo separation and directionality. The surrounds are a bit muted�they enhance the score a bit, and there are a few surround sound effects. A fine track for this type of film. Extras Review: The two Brady Bunch films are on my short list of favorite comedies, and I've been waiting for them to hit DVD since I got my player. I'm happy to finally have them in widescreen, but I can't say the same about the lack of supplements. There isn't even a trailer! I know for a fact that there are some deleted scenes and cameos from the original series' cast, and director Betty Thomas seems enthusiastic enough about contributing a commentary track, judging by her involvement with I-Spy. Sure, the movie was no blockbuster, but it was successful enough to warrant a sequel, and the films did well enough on video that they could be considered cult hits. I know they were oft requested on various DVD forums across the Internet, and I imagine there are a lot of disappointed fans out there. The Brady Bunch Movie is just the kind of irreverent, goofy comedy that plays great on video, and the bright pastels of the Brady look right at home on a television screen. Paramount's bare-bones DVD is a letdown, but at least the audio and video transfers are up to snuff. My verdict? A little cloudy, but still a sunshine day.